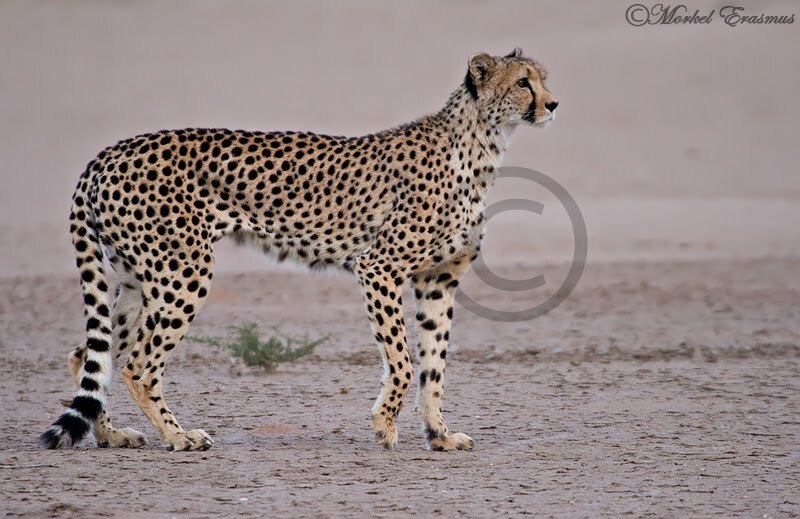 When we visited the Madikwe Game Reserve in South Africa recently, we had such an experience. We only stayed for 3 days, in which case you are hopeful for something amazing around every corner. On our first day we saw little besides a few grazing elephants - the bush was eerily quiet. The following day, however, started off with a lion roaring right beside us in a glorious sunrise, and continued on in epic fashion to deliver a herd of elephants with young ones, another lion sighting, wild dogs on patrol and later in the evening a leopard with a kill in a tree. What does it teach us? To be patient...to expect the unexpected...and to value the little privileges such as the smell of the bush, the sound of a francolin waking the world and the colour of the clear unpolluted sky. 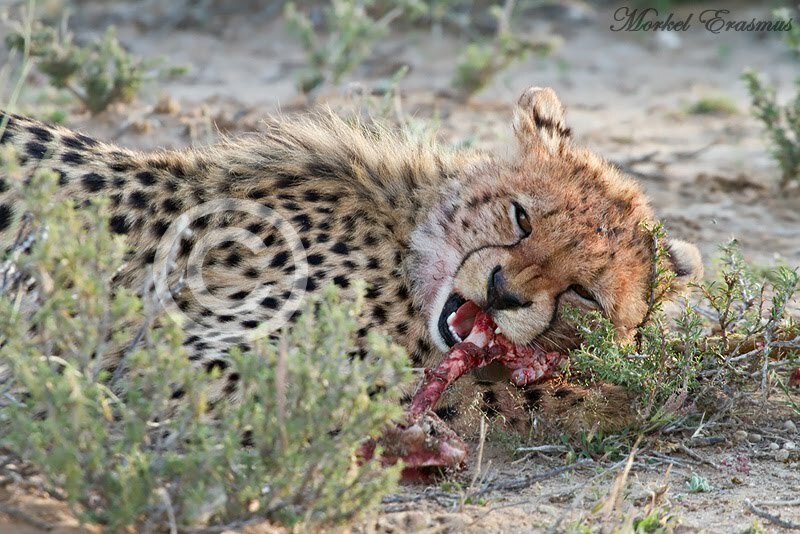 On our recent trip to the Kgalagadi Transfrontier Park we had such an experience as well. Having visited this amazing place in September 2009 we arranged a return visit as soon as possible. We arrived on the first afternoon, and saw very little on our first game drive, although I had fished out some information later that evening about a female cheetah who had reared an astonishing 4 cubs to near-adulthood. Me and my wife made it our mission to track them down. So, on our second morning, we left the Twee Rivieren rest camp at sunrise in search of cheetah...and found this young male cheetah approaching the Samevloeiing waterhole in first light! He walked straight to us and passed in front of our vehicle. 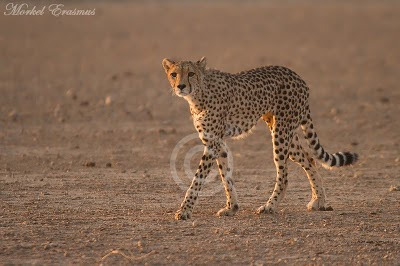 He ended up not taking a drink, but continued up along the dry Auob riverbed, no doubt looking for breakfast. 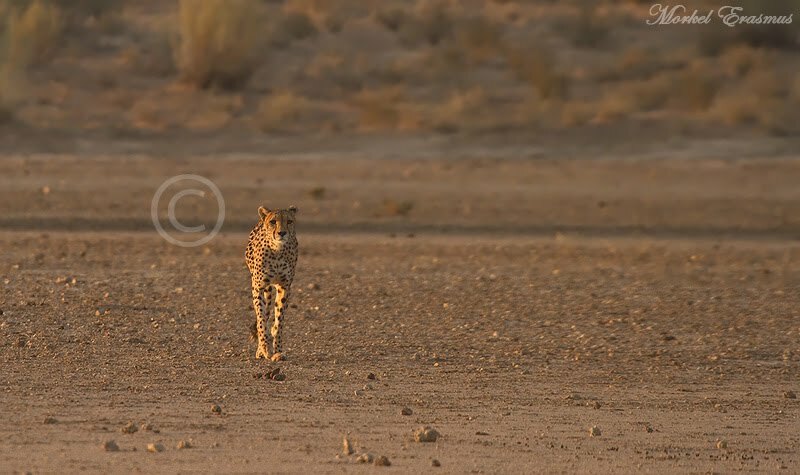 We were unable to follow him, and therefore decided to go ahead and look for the cheetah mother with the 4 cubs in the area they had last been seen in. 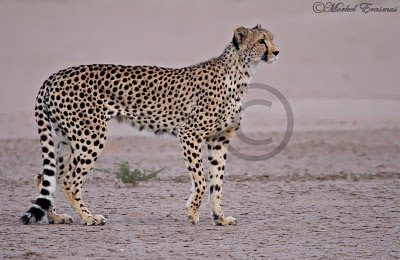 We drove up and down the stretch of dry riverbed looking for them, and ended up missing them by minutes as they came down from the dunes and crossed the Nossob riverbed, heading into another field of dunes. Other tourists had seen them, and we weren't ready to give up on them. We headed back to our chalet to rest a while after lunch before trying to locate them again. We left for our afternoon drive a little earlier than usual - at about 14h15. A short distance away on the Nossob road we found an odd sighting - 2 young springbok lambs carelessly wandering about, without a herd of springbok in sight! 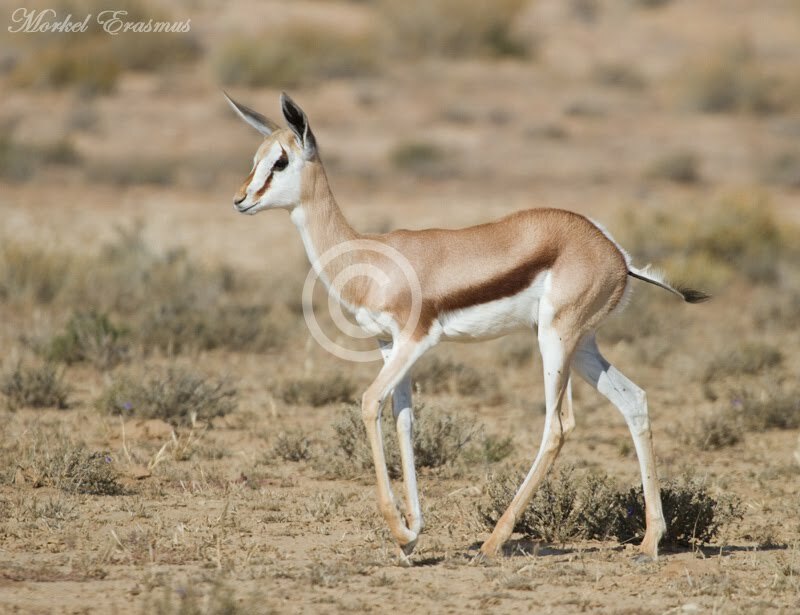 I noted to my wife that this is strange, but seeing as we weren't yet to the point where we calculated the cheetah to have gone to lie down in the dunes, I wanted to push ahead and come back to these springbok lambs as I expected things could get interesting here. Nevertheless, I quickly dismissed the "what ifs" and focused my attention on the situation at hand - they were about to start feasting on their lunch, and we had the sighting all to ourselves!! Needless to say I tried my best to make the most of it photographically, yet still enjoy it for what it was. There were times when I frantically took photos, and times when I just sat back and watched it with my eyes as it was something I had not had the opportunity to witness in more than 20 years of going to the bush. 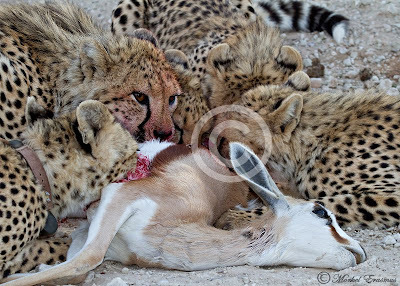 Eventually other visitors joined us, but by this time the majority of the buck was gobbled up by the hungry cheetah family. 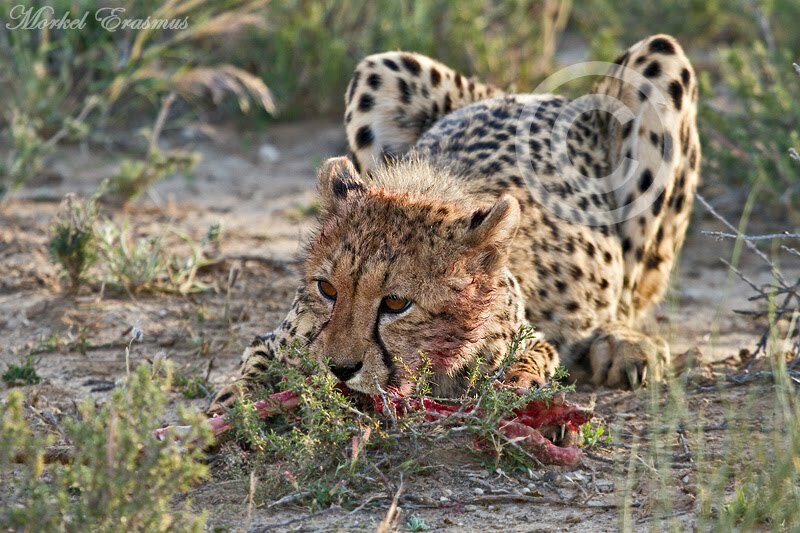 They ate at a speed that astounded me - mostly because cheetahs often get kicked off their own kills by larger predators. A cheetah will also not fight for its food as any injury will impede its ability to hunt and survive. 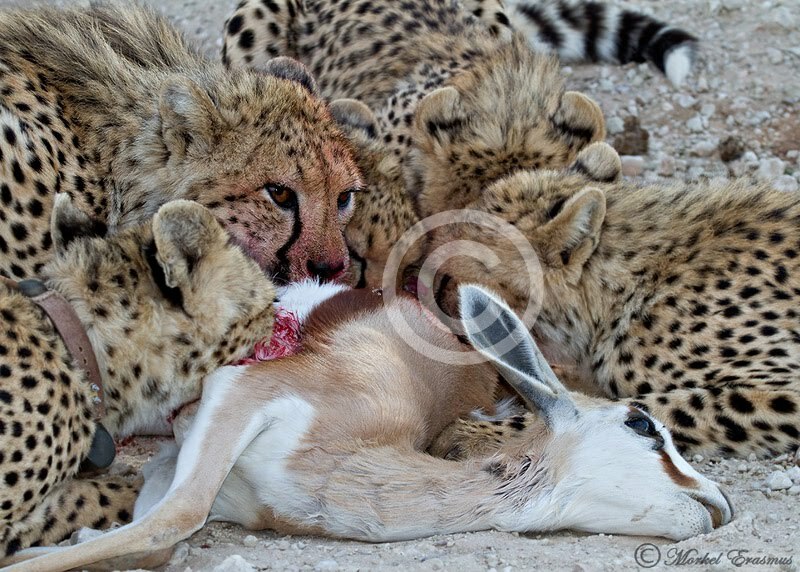 We spent more than 90 minutes with this awesome family of cheetahs. After the meal they started grooming each other and then went looking for a place to settle down for the night. 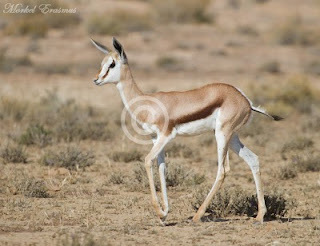 All that remained of the poor springbok was a dark patch of bloodied mud and some stomach contents. Africa is harsh but fair, and the circle of life is something majestic to witness. 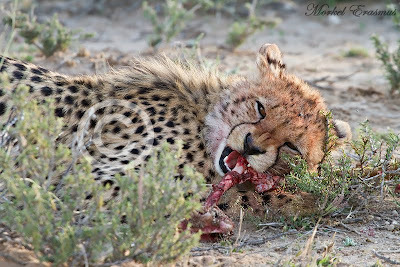 Many cheetahs have died in the Kalahari at the hands of starvation and other predators, so it was good to watch this family prosper for a change. This bloke tried to stalk a steenbok that was standing on top of a dune, but he failed and his quarry became aware of his presence a bit too soon. The light was all but gone and I had to push my camera up to ISO-3200 to capture as much of the available light as possible. 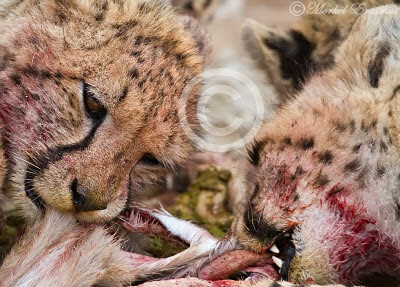 We drove back to our chalet in silence...drinking in what the Kalahari had showed us on this day. 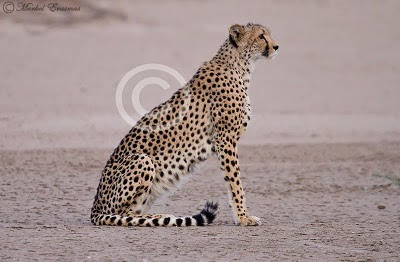 The following day would be a bit blander, but such is the ebb and flow of life on safari. 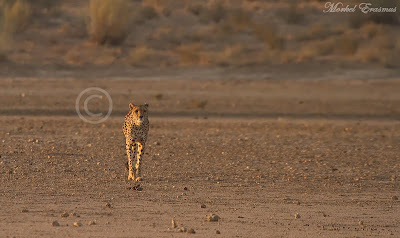 These sightings were enough to make our 1000+ km trip more than worth it, though. Needless to say I am absolutely stoked with how these images came out - it was pretty hard to choose which ones to quickly process for this blog post. I hope you enjoyed them too - let me know what you think! Awesome , stunning, just how lucky. Counting the days till November and hoping for some amazing sightings like this. 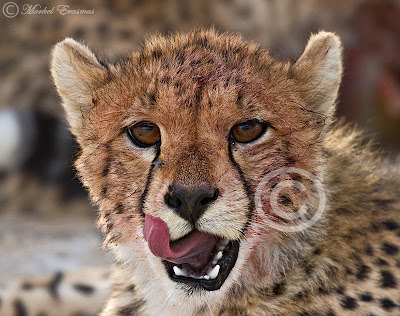 Phantasic pic from the wounderful animals. What can a guy say, Mork? John Deere, a large one! Works for me, love the one with the lamb still upright! thanks so much for the comments guys!! 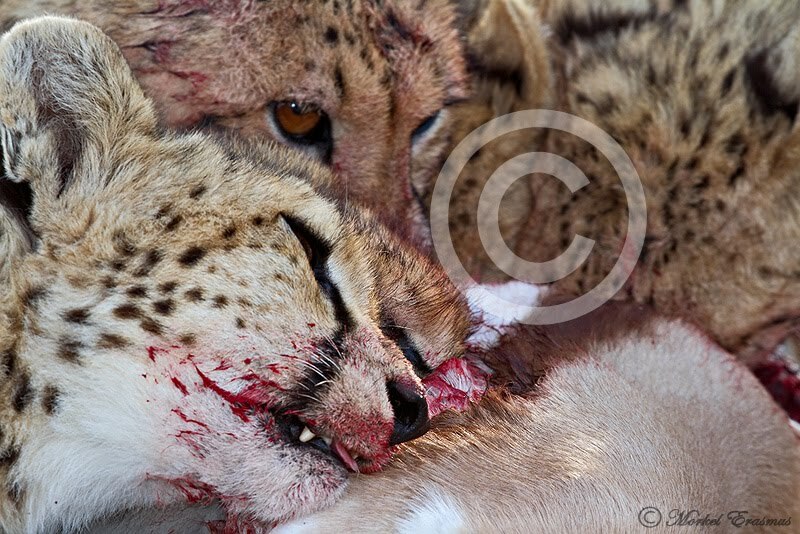 stunning photography, especially as I have just seen those cheetahs last week, recognise the one with the collar. How did you manage to get to Leeuwdril? I thought the road between Twee Rivieren and Kij Kij was closed.